Following up on National Heart Health Day this week, Dr Weil offers a view on just what is a heart-healthy diet. The “heart attack proof diet” was devised by Caldwell Esselstyn, Jr., M.D., a retired Cleveland Clinic surgeon, who views heart disease as “a food borne illness” and advocates a diet that eliminates meat, eggs, dairy and added oils. If you follow this diet, Dr. Esselstyn says you will be “heart attack proof” regardless of your family history. He maintains that his diet will either halt the progression of heart disease or reduce blockages in blood vessels that could contribute to heart attacks. The strict, plant-based diet Dr. Esselstyn advocates may benefit those who can stick to it long-term, but I see it as too extreme for most people to follow indefinitely. We already know that the Mediterranean diet can protect against heart disease and cancer. An impressive study from the University of Athens published in the June 26, 2003, issue of The New England Journal of Medicine found that people who ate a Mediterranean-style diet had a 33 percent reduction in the risk of death from heart disease, and a cancer death rate that was 24 percent lower than that for those who followed other eating practices. Even earlier, the Lyon Diet Heart Study found that within four years, the Mediterranean diet reduced the rates of heart disease recurrence and cardiac death among patients who already had had heart attacks by 50 to 70 percent when compared with the American Heart Association diet. The Mediterranean diet is a composite of the traditional cuisines of Spain, southern France, Italy, Greece, Crete and parts of the Middle East. It emphasizes high-quality fresh fruits and vegetables, nuts, legumes, unrefined cereals, olive oil, cheese, yogurt and fish. The diet only includes rare (monthly) servings of meat and infrequent (weekly) servings of poultry, eggs and sweets; it includes wine, in moderation. 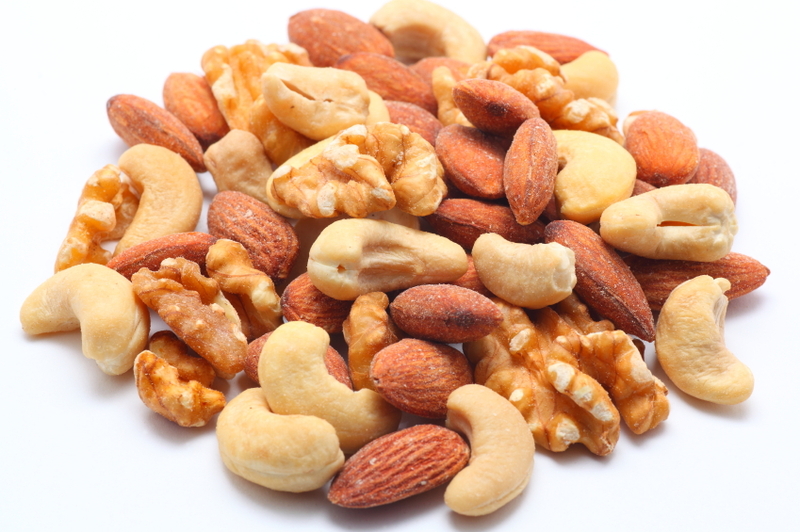 1	Nuts, especially almonds, walnuts, cashews and macadamias contain heart-healthy monounsaturated fat. Eat a moderate portion of preferably raw or gently toasted nuts every day. 2	Whole soy protein. If you substitute whole soy protein, such as edamame or tofu, for animal protein each day, you can lower levels of homocysteine, a toxic amino acid linked to increased risk of heart disease. 3	Fresh garlic. This medicinal herb may help lower cholesterol levels. Use one or two raw or lightly cooked cloves a day. 4	Green tea. It provides EGCG, a polyphenol than may help to moderate inflammation and lower cholesterol. Substitute a cup of heart-healthy green tea for your morning coffee or afternoon soda. 5	Soluble fiber. It has a powerful cholesterol-lowering effect. Beans and legumes are good sources to add to your diet – aim for one or two servings per day. Excess oestrogen, oestrogen dominance, is linked to increased heart attack and stroke risk so if you have signs of it then rebalancing with bioidentical natural progesterone is a good place to begin your new heart-healthy routine.